Cars are like burgers, and car buyers are like burger lovers. If you are like many, all of those fancy extras get in the way of what really matters. Drop the "fixins" and get to the substance. If you believe a burger should just be a burger, you'll love the straightforward simplicity of the 2017 Nissan Versa. When you do something well, the extras just aren't necessary. With the Versa, you'll get a car that will get you safely from point A to point B and do so while keeping your money in your pocket by saving you both at the pump and on the car payment. The Versa is a budget-friendly option, which probably means that you're looking for an option that won't leave you weeping as you fill the tank. Whether you're driving around town or commuting into the city for work every morning, you're probably wishing for those days when a twenty-dollar bill would fill up the gas tank. Now, with gas prices as low as they are in most areas, those days have likely returned with the 2017 Nissan Versa. Filling up the gas tank for much less than competitors because of its average mpg's of nearly 39 mpg, you will be one happy camper. One of the concerns with a compact sedan like the 2017 Nissan Versa is space. The trunk has about 15 cubic feet of space, which fits all you really need for getting around town or to work. If you need more room though, for your weekend warrior projects or the road trip to grandma's, the rear seats can fold down with a 40/60 split to give you a little extra space. While you're not going to be able to haul a couch or pick up your new washer/dryer with the Versa, you will find ample space for the everyday tasks life throws at you. Though the 2017 Nissan Versa is definitely a straightforward model, without a lot of frills, Nissan doesn't skimp on the performance. The Vehicle-Speed-Sensitive power steering is an example. This steering system, which comes standard at every level with the 2017 Nissan Versa, lets the steering become more nimble and agile at lower speeds. That makes parking and backing up a breeze. When you're out on the highway, the steering is a little stiffer, giving the car a better feel and keeping you from over-steering. If you want to pay extra for some flash and pizzazz, the Versa can absolutely deliver. The Nissan Versa SV, for example, can come equipped with NissanConnect, which will allow you to call and listen to and respond to text messages hands-free. You can use it to find where the cheapest gas around happens to be so that you can save even more money or look up movie listings to spend that extra money-all through the NissanConnect system. 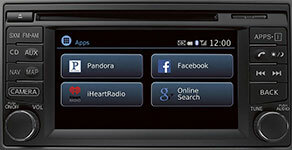 Stream music from your phone to your car wirelessly, flip on Pandora, or have an alternate route suggested. Hands-free calling to keep in touch without taking your eyes off the road. Long, wide light distribution for higher visibility during the day or rain and the ability to see more at night. Never drive around on under-inflated tires with this system, which alerts you when you might be losing precious gas mileage because of your tires. The 2017 Nissan Versa has everything you need. It's perfect for a first car for your daughter, a budget-friendly commuter vehicle, or the right choice if you are, as Lynyrd Skynyrd so poetically said, a simple man. The 2017 Nissan Versa gives you the choice, offering you performance and space without forcing options that you may not want.